Donald Trump is an American politician, businessperson, investor, television personality, and writer. He is the 45th President of the United States, having been inaugurated on January 20, 2017. He was elected to the position in 2016, running on the Republican Party’s ticket. He was the chairman and CEO of the Trump Organization, and hosted the reality show The Apprentice from 2004 to 2015, among other pursuits. He was also a candidate for the Reform Party’s nomination for President of the United States in 2000. He is again running for his party’s nomination for President, in 2020. He was Time Magazine’s Person of the Year for 2016. President Trump’s father, Fred Trump (Frederick Christ Trump), a real estate developer, was born in New York, to German immigrants. President Trump’s mother, Mary Anne (MacLeod), was Scottish, born in Stornoway, on the Isle of Lewis. She came to the U.S. around 1929, at the age of seventeen, and worked as a maid in New York. Mary Anne became a U.S. citizen in 1942. President Trump’s sister, Maryanne Trump Barry, is a prominent judge. President Trump’s uncle (his father’s brother) was John G. Trump (John George Trump), an electrical engineer, inventor, and physicist. 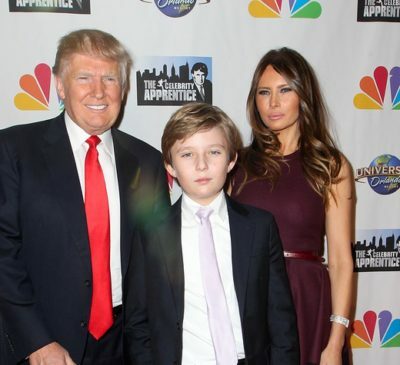 All four of President Trump’s grandparents were born outside of the United States. President Trump is married to Slovenian-born model Melania Trump; he was previously married to Ivana Trump and Marla Maples. He has five children, Donald Trump, Jr., Ivanka Trump, and Eric Trump, all three with Ivana, Tiffany Trump, with Marla, and Barron Trump, with Melania. Most of them work in business. Donald, Jr. is married to model Vanessa Trump, Ivanka is married to businessperson and investor Jared Kushner, and Eric is married to producer Lara Trump. While it is sometimes stated that President Trump’s grandfather was born under the surname Drumpf, this is not accurate. The family surname was simply Trump going back at least several generations. In his 1987 book, The Art of the Deal, and evidently in some other sources from as late as the 1980s, President Trump stated that his paternal grandfather was Swedish. This is incorrect. It appears that President Trump has not mentioned having Swedish ancestry in more recent years and/or decades. He was a grand marshal of the German-American Steuben Parade in New York City. President Trump’s patrilineal line traces back to Johann Paul Trump, who was born, c. 1727, and was from Bobenheim am Berg. President Trump’s paternal grandfather was Friedrich/Friederich/Frederick Trump (the son of Christian Johannes Trump and Katerina/Katherina/Katharina Kober). Friedrich was German, born in Kallstadt, Pfalz. Christian was the son of Johannes Trump and Susanna Maria Bechtloff. Katerina was the daughter of Johann Jakob Kober and Elisabeth Peter. President Trump’s paternal grandmother was Elizabeth/Elisabeth Christ (the daughter of Christian/Philipp Christ and Anna Maria/Marie Anthon/Rathon). Elizabeth was German, born in Kallstadt, Pfalz. Philipp was the son of Johannes/Johann Georg Christ and Sabina Christina Hartung. Anna was the daughter of Johannes Anthon and Eva Farny. President Trump’s maternal grandfather was Malcolm/Calum Macleod (the son of Alexander Macleod and Anne/Ann/Annie Macleod). Malcolm was Scottish, born on the Isle of Lewis. Alexander was the son of William MacLeod and Catherine or Christian MacLeod. Anne was the daughter of Alexander Macleod and Ann Mackenzie. President Trump’s maternal grandmother was Mary Smith (the daughter of Donald Smith and Mary Macaulay/Macauley). President Trump’s grandmother Mary was Scottish, born in Stornoway, on the Isle of Lewis. Donald Smith was the son of Duncan Smith and Henrietta MacQueen/McSwane. President Trump’s great-grandmother Mary was the daughter of John Macaulay and Isabella Murray. Bur since yiu run this site. This my last comment on ur site cause you are clearly a teen nerdy bully.. That has seen not much world, and I’m 31 year old man, tha acrtually as kid had the pleasure t to watch new York from the top of the twin Towers,. And since you are Mary Poppins and pratically perfect, but they can’t not even help me to got my mom and dad Flying a Kite with me, cause u lack of social skill. and tolerance, and I bet u r never have left ur village, cause I read afunn statement in which you arrived to affirm that French people looks exactly like German people…. Hilarious. BTW people like u are pefect for Facebook material.,,,cause there everyone has Always reason and attack any other. I duno like a clever boy like Andrew, let you bully him- Cause he seems realy cultiveted and cool. Bye Bye see you nerìvermore. Farny isn’t a German name, it’s French Hugenot, so he could have distant French Ancestry beside from his Scottish and German Heritage. http://www.irishcentral.com/opinion/patrickroberts/donald-trump-likely-knows-gaelic-language-from-his-mother-120554249-238081191 Interesting article. Donald Trump looks more Scottish and Irish than German in my opinion.